May 9, 2008: Any Trekkies out there? Remember the tricorder? Dr. McCoy and Mr. Spock both carried them, and they came in mighty handy exploring "strange new worlds ...where no one has gone before." On the International Space Station, astronauts are carrying an experimental device that looks strikingly similar: LOCAD-PTS, short for Lab-On-a-Chip Application Development Portable Test System. This handheld biological lab is the first step along the path to developing something akin to Dr. McCoy's medical tricorder. Above: Astronaut Suni Williams (with flowing "microgravity locks" of hair) uses LOCAD-PTS onboard the International Space Station. "LOCAD is like that tricorder in that it is portable, rapid, and detects a biochemical molecule," says Heather Morris, LOCAD scientist from NASA's Marshall Space Flight Center, and an admitted Star Trek fan. But while tricorders could do almost anything from checking vital signs to finding alien life, LOCAD is a little more specialized: "LOCAD is specifically designed to detect and identify microbes on space station surfaces." It is a fact of life that wherever humans go, microbes follow. Biologists estimate that every human body has at least a trillion hitchhiking microbes, accounting for as much as 2% of a person's total mass. Most live in harmony with native human cells; others can make you sick. LOCAD keeps track of these tiny lifeforms. Here's how it works: An ISS crewmember uses a dry swab to take samples of surfaces where microbes might be lurking. Flushing sterile water through the swab converts the sample to liquid form, and the astronaut puts a few drops into the LOCAD. What's in the sample? The system gives its answer less than 15 minutes later. The whole easy procedure is done on location. Nothing has to be sent back to a lab on Earth, which would take time and introduce the possibility of contamination en route. "It's important to monitor bacteria on the space station so we can find the best way to keep them under control," says Morris, who adds this curiosity: "LOCAD can't yet distinguish between live and dead bacteria." So no one can cry out, it's dead, Jim! "We're working to add this capability in the future." 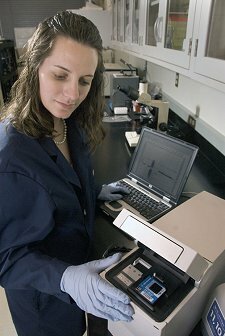 Right: Heather Morris works on LOCAD technology in her laboratory at the Marshall Space Flight Center. 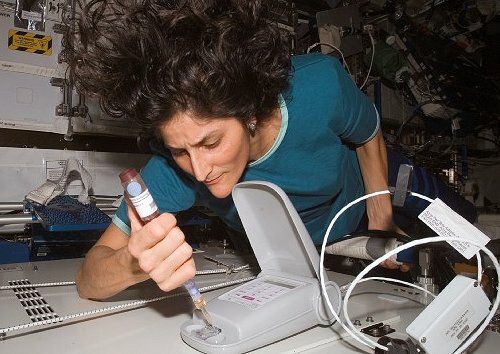 In addition to detecting Gram-negative1 bacteria like E. coli and salmonella, the latest LOCAD cartridges just sent up to station aboard shuttle mission STS-123 can alert the crew to fungi. Since fungi actually decomposed some electronics on the Russian Space Station MIR, they have become unwelcome "house guests." LOCAD can detect low concentrations of a common fungal compound; this allows LOCAD to find fungi on surfaces before the fungi have a chance to multiply. By the end of the year, yet another cartridge will be available for the space station. This one will detect the presence of Gram-positive bacteria such as staphylococcus and streptococcus. "Ultimately we want to provide cartridges for all kinds of micro-organisms and chemical compounds," says Morris. "We'd even like to be able to use our system to figure out what 'bug' an astronaut has if he or she becomes ill."
Lisa Monaco, LOCAD scientist, adds her vision of the future: "What we are developing at MSFC has use not only on the ISS, but also on lunar missions, long duration stays on other planets, and most certainly here on Earth." In the years ahead, as space voyages become longer and longer, it will be even more imperative to have ways of checking astronauts' health and monitoring electronics. For the record, no astronaut has ever become seriously ill on any space mission. However, the scientists point out that if an astronaut did ever get sick, it would take too much time to send a sample back to Earth, have it tested, and receive a long-distance answer. With next-generation LOCAD technologies, detection and diagnosis would be quick, easy, and on the spot. Dr. McCoy, here we come. Gram staining (or Gram's method) is an empirical method of differentiating bacterial species into two large groups (Gram-positive and Gram-negative) based on the chemical and physical properties of their cell walls. The method is named after its inventor, the Danish scientist Hans Christian Gram (1853 – 1938), who developed the technique in 1884 to discriminate between pneumococci and Klebsiella pneumoniae bacteria. 1Gram-negative bacteria are those bacteria that do not retain crystal violet dye in the Gram staining protocol Gram-positive bacteria will retain the crystal violet dye when washed in a decolorizing solution. In a Gram stain test, a counterstain (commonly safranin) is added after the crystal violet, coloring all Gram-negative bacteria a red or pink color. The test itself is useful in classifying two distinct types of bacteria based on structural differences in their cell walls. Many species of Gram-negative bacteria are pathogenic, meaning they can cause disease in a host organism. This pathogenic capability is usually associated with certain components of Gram-negative cell walls, in particular the lipopolysaccharide (also known as LPS or endotoxin) layer. In humans, LPS triggers an innate immune response characterized by cytokine production and immune system activation. Inflammation is a common result of cytokine production, which can also produce host toxicity.